﻿ Medium Hairstyles with Bangs or a Fringe. A funky, dark brown style with an uneven straight down fringe. The style is slightly lifted in places. Copy the look you see here by adding volume to the roots in the top of your head only. Using a diffuser, create the volume and shape that you want. Use a spritz on the nape of the neck, along with a tad of styling gel giving you the turned-under look at the ends. 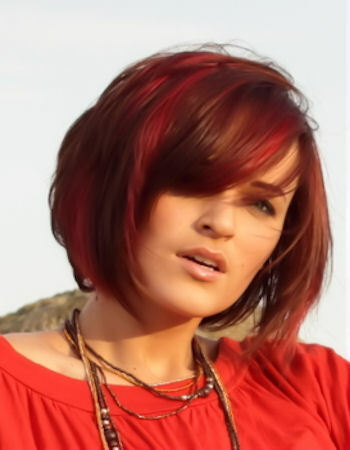 A very sleek, straight, glossy, side parted, light brown style with red highlights and a long swept fringe. Lovely flared locks look smashing in this modern version of a bowl cut style. Using wisps of hair in the back to create a softening of the bolder bangs is a brilliant twist on this long standing great cut for any face type! We especially appreciate that the bangs are NOT a blunt fringe, but rather a softer fading cut, which blends into the eyes well. This delicate style is the ultimate in feminine charm! The top remains straight and frames the face with soft wisps of bangs, while longer pieces add definition to the back and neck. A messy, textured brown style which is straight on top with a choppy, straight down fringe, but curly at the back. We love the vibrant but subtle combination of shades of blondes and light brown that we see here! About 4 different shades that can easily be added to your natural color to give you a one of a kind color scheme that will rock every day. Take advantage of the medium length bangs to bring attention to dramatic eyeliner that will define your best assets. Feathered and brushed bangs look fantastic with this medium length effect. Notice, also, the short, blunt cut and flipped ends that create a soft and touchable finish that feels like a warm campfire at night! A curly, textured, side parted, and a choppy, swept across medium length fringe. To make sure your locks shine, you can either buy a shine serum and apply to your hair, or you can do it the old fashion way, which is what I prefer. Mayonnaise is my secret hair weapon of choice! Buy a high-quality mayo, or better yet, make your own and apply to damp hair for about 30 minutes. Shampoo out and you'll have enviable shiny hair like we see here. High shine also takes this cut to a new level, adding depth and dimension that otherwise would be lost on a dull head of hair. Movement is the word to describe this sophisticated cut. The length here is perfectly in tune with run way models and red carpet heads, plus the textured ends give added sway. Give this style a try if you are looking for a way to accent your straight hair! The high gloss look is a must to be able to pull this off, otherwise, you could end up frumpy instead of sassy!